Daibutsu-ike Pond of Todaiji-Temple in Nara Park is one of my favorite sites as a leaf watcher. 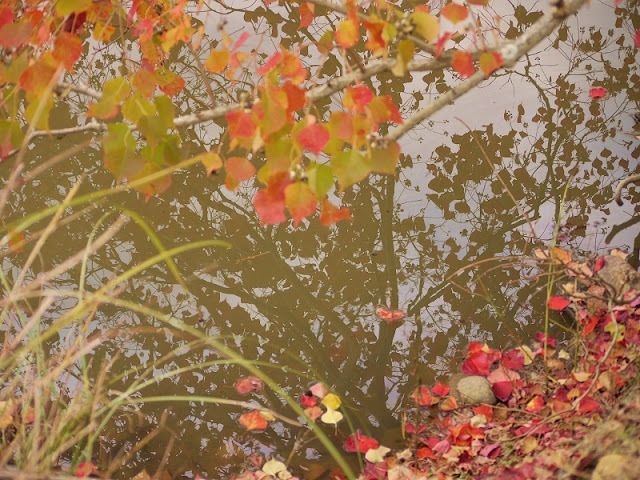 Trees have broken into colors later than ususal due to warm weather. 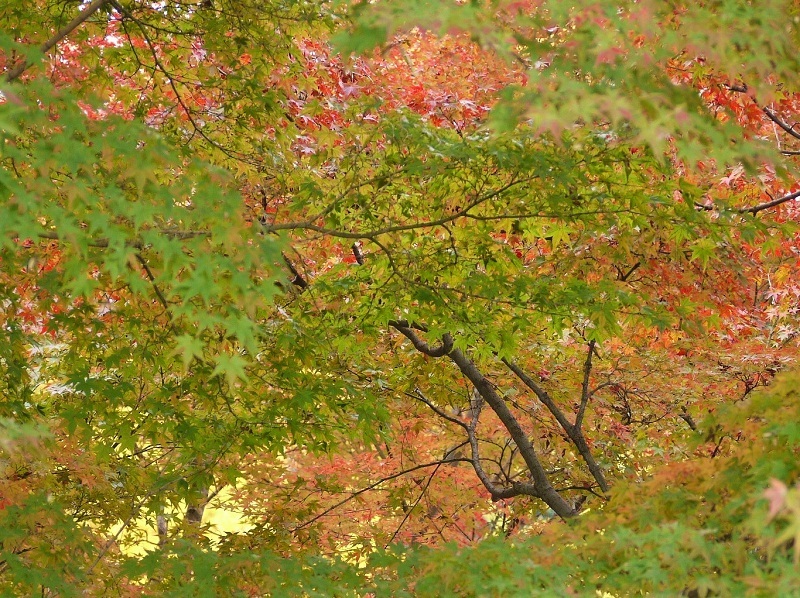 Let’s enjoy the autumn color show! First of all, how about yellow with tint of gold? Susuki (Japanese pampas grass) and the blue sky with clouds joined. Can you spot a spider? ナンキンハゼ(Nankin-haze), or Sapium sebiferum, has fallen some of their leaves. The area is filled with vibrant colors of red, vermillion, orange, yellow, and green! This post is a contribution to the Weekend Reflections. For more reflections, visit the site, here. They are images filled with poetry, I want to be there. Somehow I envy that beautiful dear you've caught in your picture, Yoko, and the small spider dangling in its web among such colours. Thank you for your gift of beauty and I wish you a great weekend! What an absolute treat. You leaf pictures are exceptional. Hello Yoko, it's always a pleasure visiting your blog!! Your post today is like a dream! Gorgeous! 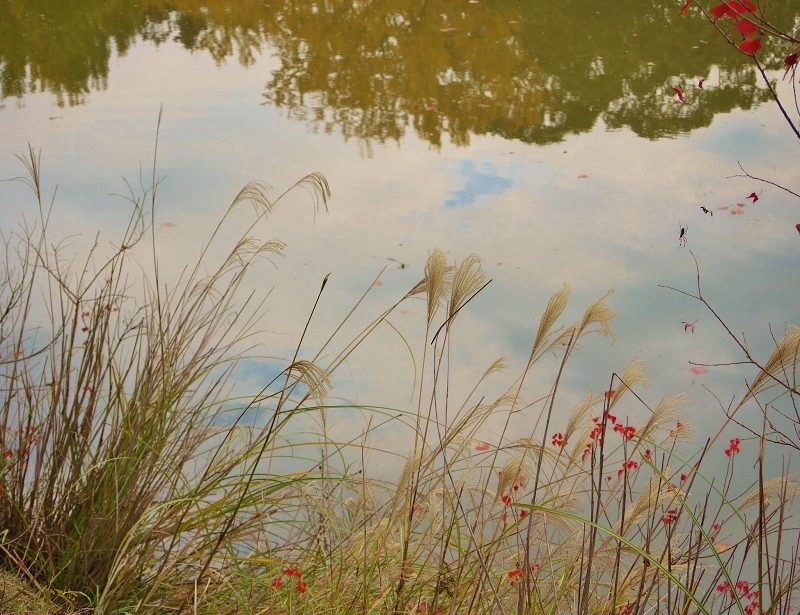 Your pictures are so peaceful!I felt an inner peace seeing them. Thanks. I love seeing your late autumn leaves, as our trees have long ago shed theirs. What a great place. There are many places like this in Japan. I also visited to see autumn leaves last week. It's also awesome. Your pictures seem paintings. Thanks for sharing. The photo with the deer looks like a scene from a fairy tale. Pictures are so beautiful Yoko. these are such wonderful photos, the colours just beautiful. The second one makes me think of a silk painting. The quiet still deer is perfectly posing for you. The mixed colours of leaves remind me of something and I think it is origami paper that I have in the same tones. I love the delicate maple leaves. 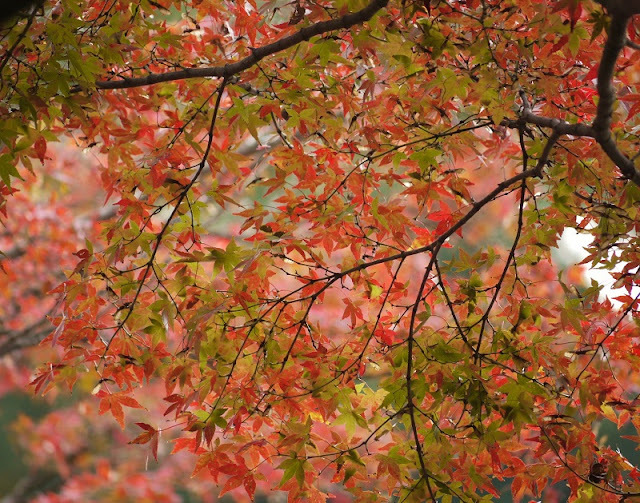 This time last year I climbed up Mt Takao on the outskirts of Tokyo and enjoyed the last of the autumn leaves. Penelope – A spider is hanging on its cobweb, though we don’t see the web and the spider looks hanging in the air. When the photo is divided into sixteen, it is close to the forked twig in the second row of the rightest column. Yes, there must be many small creatures hidden in that nature. I went there before one week. But leaves were not such yellow and there were few fallen leaves like my last blog I posted. You know the best time well! I like the fourth photo. Shadows in the pond is interesting shape and color. These photos are fabulous, the blend of gold, brown and yellow gave them so much depth. Amazingly a Chinese friend gave me today a small Japanese maple which she grew from as seed. The foliage is so delicate! Yoko,this place is stunningly beautiful.I was going to choose a favourite image but they are all so lovely I'd have to include every one. Enjoy your park and the remainder of autumn. What a beautiful colors and natural compositions .Great to see and thanks for showing. Your photos are beautiful, Yoko...how lovely they would be in a grouping on a wall. I especially liked the one of 'real maple leaves and reflected ginkgo leaves'... but then when viewing the others, they became favorites too! You did a wonderful job in capturing their gentle loveliness! impressionist pictures ... the colours are very soothing ! Oh gosh --- this post is like a lyrical poem of beauty! So gorgeous. I hope you are oke! The colors you are showing are beautiful. The tree's overhere are without leaves by now. What stunning photographs! The combination of real and reflections is beautiful. That deer lives in a paradise. The tiny spider looks like it's walking among the clouds. I'm enjoying the glorious autumn in Nara seen in the photos of my Japanese friends. 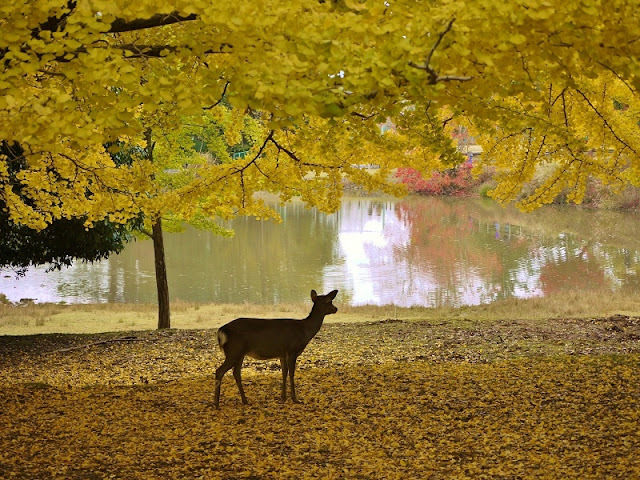 The deer looks enthralled with that burst of red in the midst of the gold. Autumn is such a beautiful season. The colours in your photographs are stunning, so vibrant and glowing. The first photo with the deer is lovely. Absolutely gorgeous. I thank Lady Fi for pointing me your way. That top image is a true gem. Beautiful and delicate colors of autumn. Great shots of nature. The grass on my blog: This is the same genus of grasses - Susuki. There are grown as ornamental grasses in the garden or park. Today is no fog. It was the sun and heat. Incredibly, the approaching Christmas. Wishing you a wonderful start to the week. / Peter. 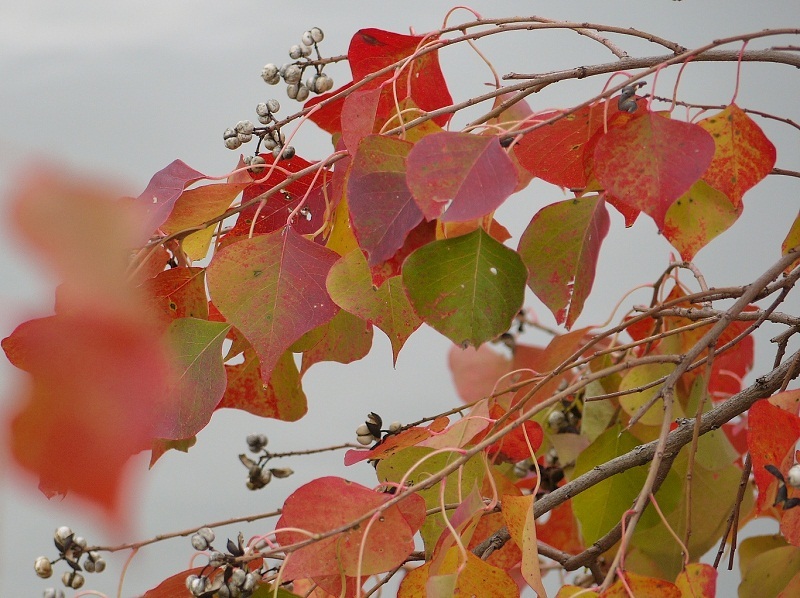 You have captures the beauty of the leaves very well. And I very much like the photo of the deer. There is within me, as I view your gorgeous photographs, a feeling of pure bliss. I think if I were so fortunate as to take photographs like these I would hang them on a wall in my home under the title, "Autumnal Bliss." such gorgeous photo's that really draw me in to the beautiful scenery!! your words, your photo's all exceptional. the first is my favorite as i have a soft spot for bambi!! Thanks for sharing the lovely colors. The deer and yellow image is my fav. i came back to say congrats on your POTW from hilary's site! Some of the most beautiful photography I've seen in a long time. Thanks, Yoko. 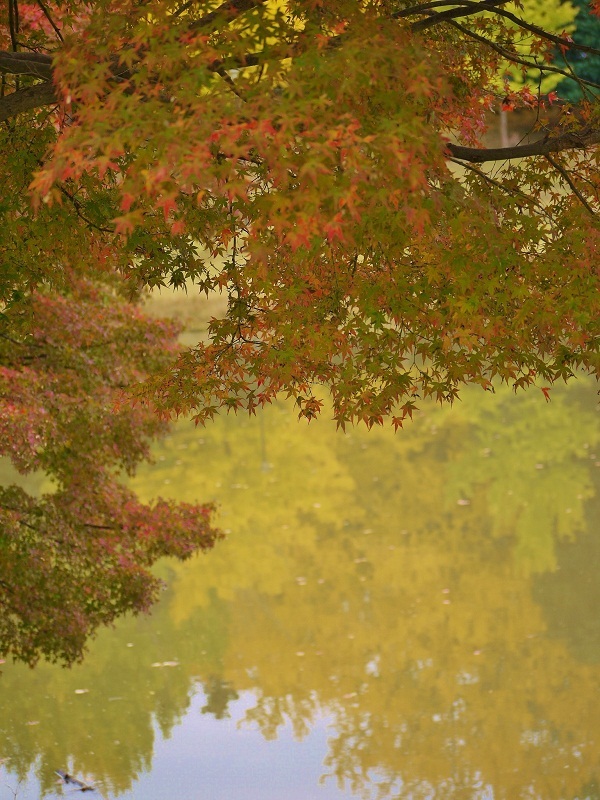 The Autumn in Japan, is great!!! And the reflections are so nice!!! Your photos are so pretty. Our leaves are finally turning color as well. The desert has had a very mild beginning of winter. I am happy for that. I am not a happy person when I am cold! I know the cold will come soon enough but nothing in comparison with snow covered grounds. That I am thankful for! Simply beautiful photos. The colours are gorgeous! Yoko, really lovely. Wish I were there! This park is amazing. Your photos are too. I liked a lot. Thank you. Thank you also for your visit.